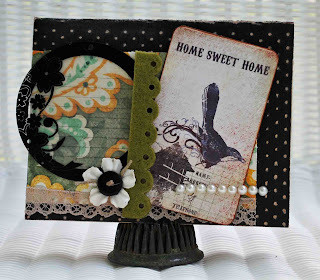 I used the following items from Papertrey Ink: twine, stamps, ink, button, and cardstock. I also used Martha Stewart ink & scalloped punch; and Copic markers. I also added some stickles for a little glitter! And I used Spellbinder Nestabilities. This card was so fun to put together thanks to a great sketch. 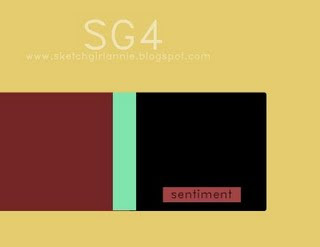 Visit the Sketch Girl blog for more inspiration! 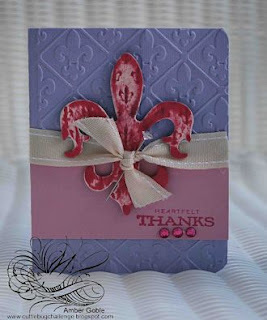 I used my Cuttlebug & the Fleur de Lis embossing folder. 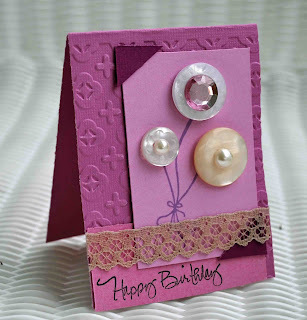 I then used Tattered Angels chipboard (that coordinated perfectly with my embossing). 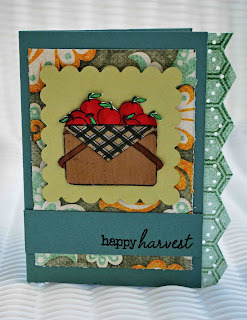 I used Papertrey Ink's Raspberry Fizz ink to color the top of my chipboard. I wanted it to have a rough, unfinished look. 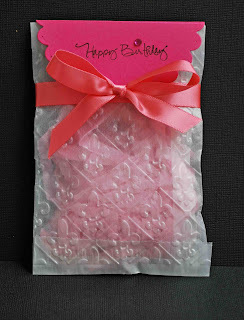 I then added Papertrey Ink ribbon around the card and a Thank You stamp...plus a little bling. Visit Cuttlebug Challenge to see the DT's beautiful creations! 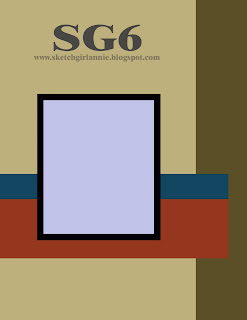 I am so excited to be a Guest Designer at Sketch Girl!!! 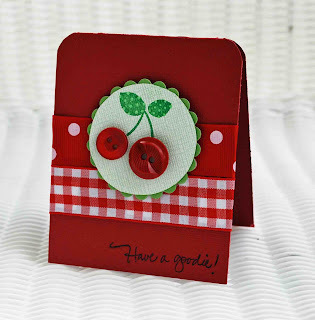 I get to play along with their next 2 challenges and my card is being Spotlighted tomorrow on the Sketch Girl blog. This week's sketch is great! 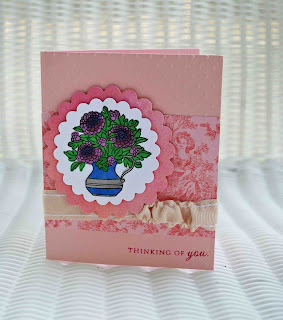 It's Tuesday and that means another challenge from Die Cuts R Us DT Blog. This week's challenge is to use 2 products from the DCRU Store. So take a look around the DCRU Store and find 2 products you have and make a project, card, or LO. I used my Cuttlebug & the Victoria folder, Just Rite Stamps, Copics, and Spellbinder Nestabilities. All these things can be found at the DCRU Store. 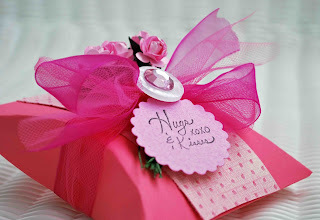 I also used Papertrey Ink cardstock & ribbon. I ran white ink over my embossing...love how white ink looks on yellow paper when using this folder, 1 of my favorites. It really makes the embossing stand out and you would never know white ink was the highlighter. Visit the DCRU DT Blog to check out the DT's beautiful creations this week! Today was definitely a lazy day. There's nothing like Sunday's this time of year. The air was crisp and cool. You can definitely tell Autumn is around the corner. I used Papertrey Ink stamps, ink, and paper. I also used My Mind's Eye paper, Martha Stewart punch & ink, Copics, and Spellbinder Nestabilities. Now for some barnyard pictures. 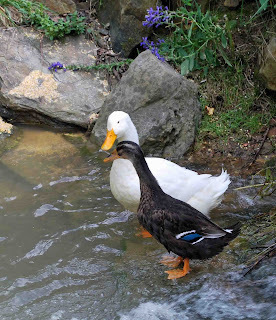 I know you all have seen pictures of my 2 white ducks (click to see an older post). 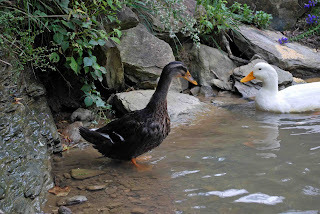 Well my girl duck passed away this week and my boy duck (called a drake) was very lonely. So Hubby went and bought me a new duck and our drake is happy again. And our new duck (no name yet, any ideas?) LOVES the water, I don't think she had ever been in water before. 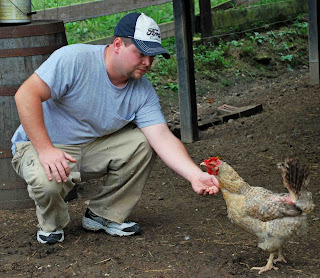 Here's a picture of Hubby feeding a chicken. We say she must be part goat because she runs anytime there's food around. 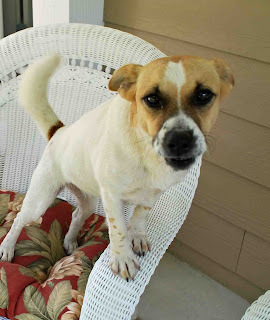 She will eat chicken, horse, dog, and cat food. And she can't get enough bread. I love how she's looking at Matt. 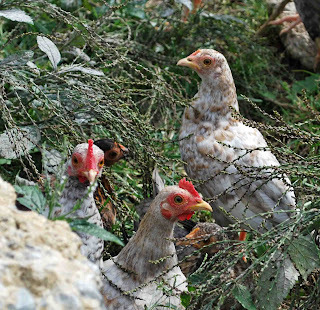 Here is another picture of some of our young chickens. They are just so colorful! 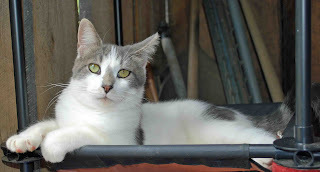 And last but not least....the baby of the barnyard...Mr. Kitty. We still mistakingly call him Ms. Kitty from time to time, old habits are hard to break! Click to see the Mr. Kitty mix-up post. I used Papertrey Ink stamps, ribbon, and paper; Swiss Dots Folder, Spellbinder Nestabilities, and Copics. And I've got some advice, don't be afraid to use your pens and experiment with colors. I've been playing with my Copics & Martha Stewart markers and it's just amazing how you can blend colors. Just wanted to share a quick post with you today. Friday I have a tutorial at DCRU and Monday I have one at Cuttlebug Challenge. So I've been a busy crafting girl! 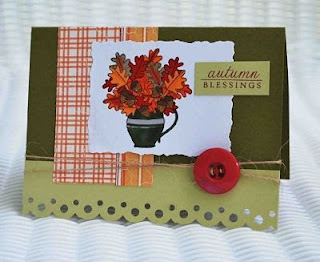 These beautiful Autumn days are perfect for spending time in my scrap room. I used Core'dinations paper, ribbon for my background, Spellbinder Nestabilities, buttons, and Copic Markers. A super easy card. 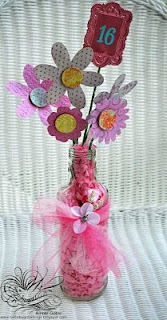 For this project I used an empty bottle and tied some tulle around it, added stick pins and a flower to glam it up. 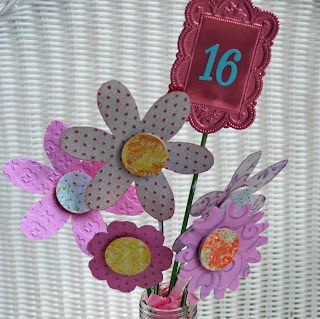 I then cut out a bunch of different flowers from chipboard flowers I have and ran them thru my Cuttlebug. The Cuttlebug folders I used were Swiss Dots, Moroccan Screen, D'vine Swirls, and Victoria. I used Core'dinations paper and then sanded my embossing. Visit Cuttlebug Challenge to see the beautiful DT creations. And take part for your chance at a prize! Hi everyone. 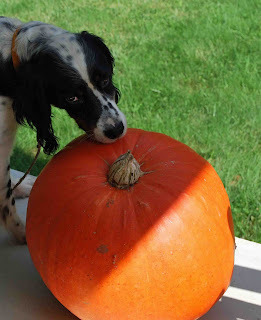 I had so much fun with this week's challenge at DCRU DT's Blog. 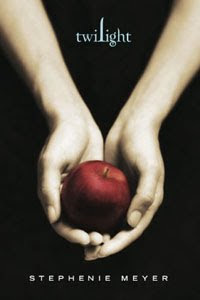 Are you ready to hear it? 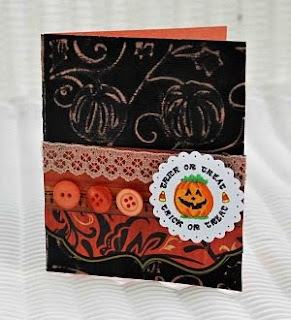 Make a halloween card, project, or LO. This week our host is the amazingly talented, and my DT buddy, Cara. I decided to use my new witch way Just Rite stamps that can be found at the DCRU Store. I have a feeling they will sell out fast! I used my Just Rite Stamps, Martha Stewart Ink, Copics, Core'dinations paper, Cuttlebug & Pumpkin Harvest folder, Nestabilities - scalloped circles, Cosmo Cricket paper, lace from The Little Pink Studio, and buttons! The Pumpkin Harvest is one of my favorite Cuttlebug folders and I just love all the details of the pumpkins and vines. Be sure to take part in this week's challenge for a chance at a great prize! And visit the DCRU DT Blog to see the DT's beautiful creations! 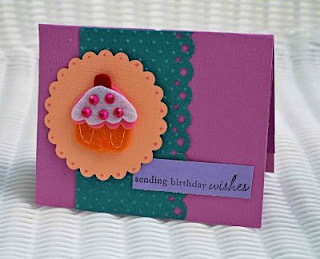 This week at Cuttlebug Challenge our challenge is to make a mini album using our birthday theme. Participants can make any kind of mini album they like out of any material, I'm excited to see what you make! 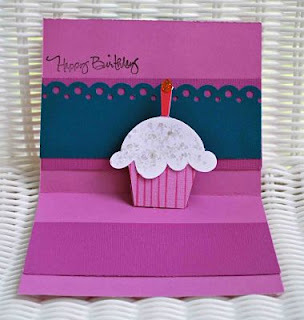 I used a Creative Imaginations Cupcake Chipboard album. 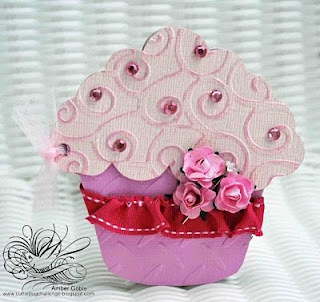 I used the chipboard cupcake as my template to cut out the bottom and top of my cupcake. I used all Core'dinations papers. The bottom of the cupcake is embossed with my Cuttlebug & the Diamond Plate. The top is embossed with my Cuttlebug & D'vine Swirls. I added some jewels for sprinkles. I used the Core'dinations White Wash paper on top so I could sand my swirls to make it look like icing. I then added some ribbon from Papertrey Ink. 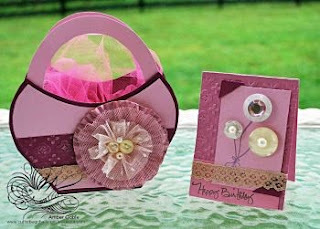 Check out Lisa Johnson's blog to see a FUN technique to ruffle ribbon. I used flowers & tulle from The Little Pink Studio and a stick pin. Be sure to check out the beautiful mini album creations from the DT! Loads of inspiration! 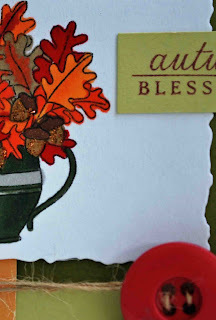 Already time for the next challenge at Die Cuts R Us DT's blog. This week's challenge is to use "other medias", for instance you can use paint, inks, pens, chalks, markers, glitter, mists, etc. This also includes using these on embossed images (if you have embossers) or on die cuts to bring them to "life". Its a chance to play with your die cuts and all of your other goodies that may not come out of the craft box that often. My wonderful DT buddy Gwen is hosting this week's challenge. Mom got me the die cut pillow box at The Scrappy Gourmet. I used Core'dinations White Wash paper and ran it thru my Cuttlebug using the Swiss Dots folder. I then sanded my embossing and ran ink over the entire piece of paper with Martha Stewart Ink. 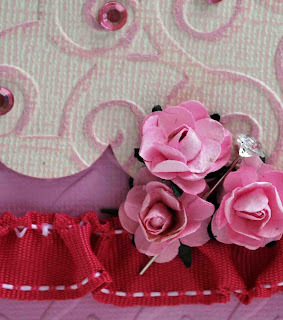 I added some Tulle and Flowers from The Little Pink Studio, more ribbon, and blingy button & jewel. I used my Cuttlebug & Spellbinder Nestabilities. I also used stamps from Papertrey Ink. Be sure to stop by DCRU DT Blog and look at the amazing projects from the DT. And be sure to participate and leave a link to your creation! 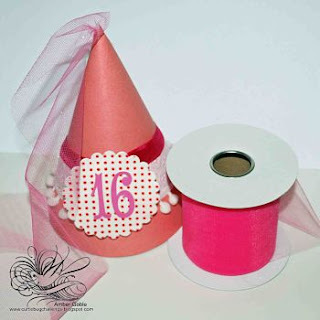 Visit my tutorial at Cuttlebug Challenge to see how to make this cute party hat! I used Core'dinations cardstock, Papertrey Ink Timless Template & Stamps, random buttons and jewels, my Cuttlebug & the Moroccan Screen embossing folder, and Martha Stewart Ink. 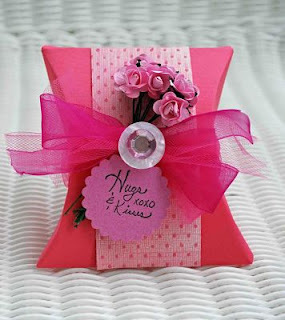 This was such a fun little project and so girly! And I want to add a little toot. 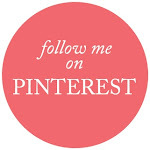 Follow this link to Scrabooking.com Magazine to see my latest publication. 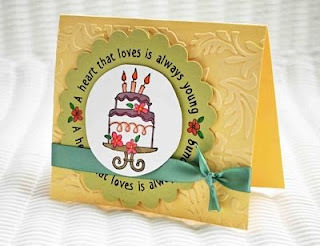 And be sure to visit Cuttlebug Challenge to see all the amazing birthday ideas the DT have in store for you! Today's Tuesday and that means a new challenge at DCRU! 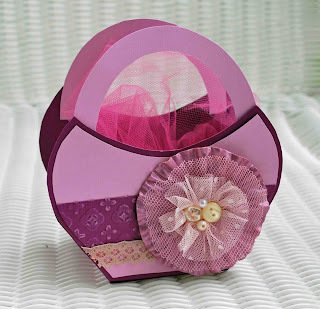 Oh my goodness, this week's challenge was to make a pop-up card. I had never made one and REALLY struggled. Still not too happy with the outcome, compared to the beauties my DT pals made....but it'll do:) Carole did a great job with this week's challenge and post! She's a creative genious, you really need to check out her blog. I used Core'dinations papers, Cuttlebug & Swiss Dots Folder, Papertrey Ink stamps, Sassafrass and Felties, Cricut & Doodlecharms Cartridge, & Spellbinder Nestabilities. 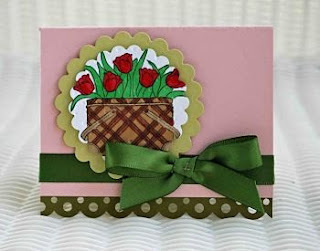 Stop by DCRU's DT Blog and see all the beautiful creations the DT made. And be sure to participate! 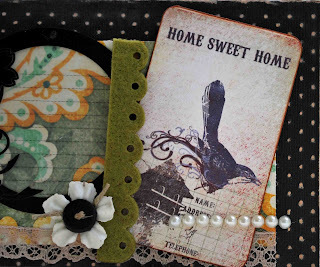 I used Core'dinations and My Mind's Eye Papers, Cuttlebug & Swiss Dots folder, My Mind's Eye tag, lace from Little Pink Studio, Fancy Pants Felt, and random embellishments.